Summary from Goodreads: No one is like Daemon Black. This story revolves around the gang trying to rescue Beth, Dawson's hybrid girlfriend from the DOD. In order to do this, they find themselves teaming up with an unlikely (and perhaps untrustworthy?) ally. Meanwhile, Katy and Daemon have finally gotten past pushing each other away and are busy solidifying their relationship (in more ways than one). Tension. A lot happened in the last two books and none of the characters got past all of those events scot-free. I liked that Armentrout didn't let everyone patch everything up quickly and easily in Opal. Instead, all of the characters are dealing with the ramifications of what has happened to them and they are not all dealing with things well. Dawson has to get past a year of torture and his fears over what has happened to Beth to become human again (okay, Luxen). Dee is traumatized by Adam's death and doesn't know if she can forgive Daemon and Katy for the lies that helped lead to it. Katy suffers from guilt, but is also experiencing love for the first time. It all makes for great and honest storytelling and I loved it! The rescue storyline. I was definitely on the edge of my seat, waiting to see what would happen when they went to rescue Beth. I don't want to spoil anything, but it was exciting! This book made me a true Lux believer. I am very glad that I'm reading this series now and I just hope that the next book continues the positive trend! 5/5 Stars. Waiting on Wednesday is a weekly event hosted by Breaking the Spine that spotlights the upcoming releases that we're most looking forward to. It doesn't take a brain surgeon to figure out what my pick for this week is. Luckily, I don't have to wait for long! Oh perfect!! I looooooved Opal! Cannot wait for Origin either! Come on August 27th! Thanks for stopping by my blog earlier! Have a great day! Probably a good plan. 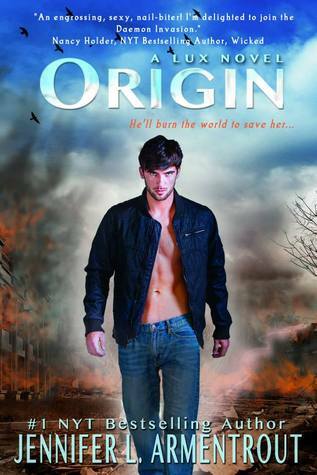 You'll definitely want to read Origin once you read Opal. I have yet to start reading the Lux Series, but I really want to someday...Hopefully soon!